With our 30-Day Money Back Guarantee you have nothing to lose! Have Questions? Call us toll-free at +91-141-5170277 Today! If you're not satisfied with our service. No Questions Asked. on all our Shared, Reseller, and Virtual Private Server Packages! 24/7/365 expert support via Help Desk. 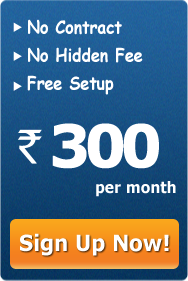 Web Hosting 4 India finds its place among one of the best shared web hosting providers in India. Well, shared web hosting is simply a single web server where many customers reside and share their accounts. Thus overall shared web hosting is the ultimate solution for bloggers, website designers, e-commerce stores and small businesses. At Web Hosting 4 India, we have a bulk load of hosted domains with highly professional staff that provide excellent support service around the clock. You will never regret web hosting with us. A few of the awesome features we provide: We avail our customers to unlimited disk space and bandwidth with the flexible and user friendly cpanel control panel. The 99.9% uptime guarantee, unlimited sub domains, FTP accounts and email accounts along with 45 days money back guarantee makes us all the more popular in the web hosting market. And this is not it! We also offer instant shopping carts, blogs, portals, forums, counters, and Form mail along with password protected directories and custom error pages, web based file manager, hotlink protection, IP deny manager and URL redirection. Our programming and most sought after database features include unlimited MySQL Databases with PHP MyAdmin Access. We get your programming done in CGI, Fast CGI, PHP 5, Ruby on Rails, Perl, Python and SSI language. Our programming modules include Curl, CPAN, GD Library and ImageMagick. We have a stock of the best email features in the industry too. Our support chain is the most talked about in the market. We offer 24/7/365 Premium Support via Phone, Live Chat, and Ticket System (Email) without fail. Server monitoring is also offer round the clock. And to make things better there is provision for automatic weekly off-site data backups too.